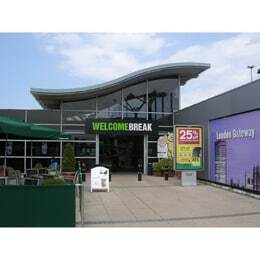 A Welcome Break service station on the M1, which serves more than one million customers every year, has successfully undertaken testing of Morley-IAS by Honeywell's new DX ConneXionTM fire alarm panel. The installation at the London Gateway site, which is home to restaurants, a Waitrose food retail outlet and a coach passenger terminal operated by holiday travel firm, Shearings, features a new DX ConneXion two-loop panel connected to various detection and audible warning devices. This is the first implementation of the new panel by Morley-IAS partner, MCW Electrical Services Ltd, who have installed DX and ZXSe panels in 18 of the leading leisure chain's 26 motorway service stations as part of a planned programme of upgrades. "The new ConneXion panel represents a major step forward," believes MCW's managing director, Mark Ward, "as it has a highly attractive look and feel and is designed to be simple to install, configure, use and maintain over its lifetime. For the end-user, the large backlit display panel has a mobile phone-style keypad, with navigation keys in one logical group, making text input more intuitive. In addition, the simple on-screen instructions include easy-to-follow confirmation prompts before taking evacuation or other actions. "This is vital in a busy public facility operated 24/7 with duty managers who may not have specialist fire safety expertise and who will need to respond quickly and in a controlled way in the event of a fire-related emergency," Ward says. Welcome Break selected Morley-IAS as it offers a highly cost-effective open protocol approach to fire detection and safety, giving flexibility in the choice of service provider. "The new ConneXion panel builds on the success of the existing Dimension series and is perfectly designed for Welcome Break-type leisure applications," confirms Ward, whose company has 13 years' specialist experience providing fire safety solutions for roadside services and has the maintenance contract for all Welcome Break sites. As a result of the successful beta test at London Gateway Services, Welcome Break has agreed to incorporate the new ConneXion fire alarm panel within the ongoing improvement programme. "ConneXion combines the traditional Morley-IAS qualities of reliability, flexibility and value with advanced features and more intuitive functionality," he confirms, "making it the perfect choice for busy environments with high customer throughput."